By Zack Quaintance — Hawkman by Robert Venditti and Bryan Hitch feels like a throwback (in a good way) for a couple reasons. First, it’s a story of a modest scale. This is an odd notion, given we're talking about a comic that spans all of space and time, but at its core Hawkman is a relatively simple adventure starring a character who is unraveling personal mysteries while also combating threats to the larger world. Second, it features killer artwork by Bryan Hitch. Regarding Hitch: it’s often hard to see how the standards and conventions of a storytelling medium limit it until someone breaks them. This was true of my perception of comics in the ‘90s (a super weird decade, yet not as bad as its reputation...a topic for another day). Hitch’s work on The Authority showed me the freeing potential of excessively splashy spreads brimming with gigantic action and wide perspective. Basically, I’d never realized how claustrophobic most books felt until Hitch blew it up. Lately I’d forgotten how much a revelation his style once was, especially since it has now become commonplace in superhero stories. Obviously, it’s not a fit for every book, and it has maybe been overdone at times (way overdone), but when used well as it is in Hawkman—look out. And so that’s what I’d like to discuss today via five-panel explainer: how Hawkman soars on the wings of old school adventuring and free-flying artwork. Let’s do it! Like many DC heroes, Hawkman is a great character with a long and convoluted history, one that can potentially act as a barrier of entry for new readers. Venditti and Hitch realize this, and in Hawkman #1 we get this stunning panel, which orients us and conveys the basics while also establishing that this book is about our hero himself coming to terms with his background. Basically, they’re telling us relax...it’s okay to be confused. We’re heading out—together—to explore. This killer spread from Hawkman #1 does a great job refreshing the current state of Hawkman's continuity. From Hawkman #3, our hero pours through his journal, reminding us of the status of his quest. This second panel is less visually-exciting, yet it’s just as important as the one above in terms of giving structure to the narrative. If that frenetic spread establishes we’re sorting out our hero’s past together, the journal acts as a device for reminding us what we’ve so far learned. It gives our protagonist an organic means of taking stock of his progress, and it gives Venditti a nice way to craft interesting narration without showing the writer’s hand in the story. It’s been well-done through three issues, and I'm hoping we’ll see more of it moving forward. Not to go too far into the story, but this book is about Hawkman learning he’s been reincarnated not just over time but also throughout space. In any given issue, the story goes to another planet, another time, and then back to present day. It’s a lot and it could become unwieldy...if Venditti and Hitch weren’t so good at creating pedestrian visits to things like subways and museums. Basically, this book positions Hawkman as the Indiana Jones of the DCU, and so it needs the cleaned up scenes where Indie is curating or teaching classes. So far, we’ve gotten them done well. This panel is a personal favorite. The significant of an epic quest can sometimes get lost if there's nothing present to ground a character, which Venditti and Hitch do well in this museum scene from Hawkman #2. An old school adventure comic book is nothing without its monsters, and Hawkman is no exception. This was the hardest panel to pick because there were so many good choices, but I went with giant angry ape (apologies to giant angry T-Rex and giant angry flock of automaton birdmen). This is classic Hitch, with larger than life kinetic artwork that explodes through panels and off pages. Love it. What's an adventure that travels through space and time without giant angry monsters? Scene from Hawkman #1. 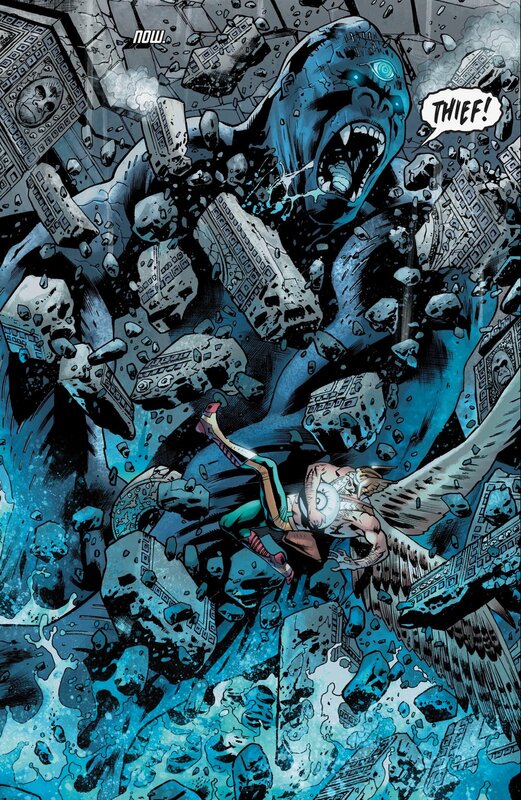 Perhaps the most important panels in the entire series are those in which Hawkman takes to the sky. Artwork from Hawkman #3. The best visual bits of this book, however, are the open skies...as they should be in a story about a flying character. There are plenty of closeup action shots, sure, but Hitch and Venditti often pull the theoretical camera back to show us what a speck our hero is against the vastness of the sky he moves through. This framing is used often and clearly not meant to diminish his stature, which it really doesn’t—we’re never more than a panel or two away from him hitting a dinosaur or something with his mace—but instead it aims to show us the freedom of his explorations, the limitless nature of his life and his journey, and it wildly succeeds. To wrap up, I’ll say that through three issues Hawkman has established itself as a welcome addition to DC’s superhero line, a book that flies a bit beneath the radar, content to function on its own as a rewarding and good-looking read, hard to predict and loaded with mystery. It remains to be seen if the creative team can take the protagonist to meaningful places through a prolonged run, but Venditti has a good track record with long-form superheroics (see X-O Manowar and the recently-concluded Hal Jordan and the Green Lantern Corps), while someone in Burbank deserves a hearty pat on the back for fitting Hitch’s artwork to this character and story.